I was planning on posting this last night but the problems with our service provider meant no forum. Luckily Bump, true to form sorted out the problem once our provider had finally taken notice of our complaints. 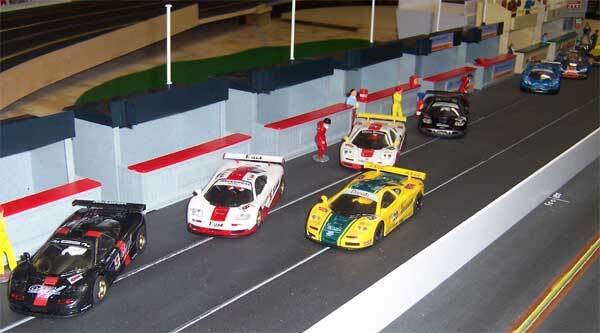 Anyway this was our last round for the year where we raced Ninco McLaren F1GTR's with NC1 motors and lights fitted. Thr format was to race 15 minute heats and then turn out most of the lights and race a night set of heats also. We ended up racing 7 minute night heats as the time was marching on. 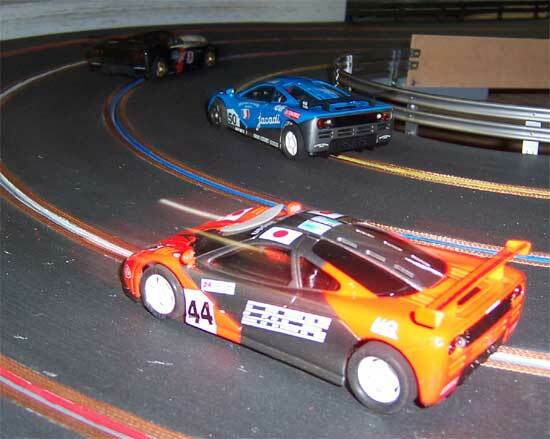 A couple of pics showing the different liveries raced on the night. Surprisingly we all had a different liveried car which was not planned but shear luck. I had a second car ready but unfortunately not fully sorted which I later found by lap times and popping the engine and losing 20 laps fixing. My Gulf looked the part anyway. As can be seen lots of rare cars ready for battle. 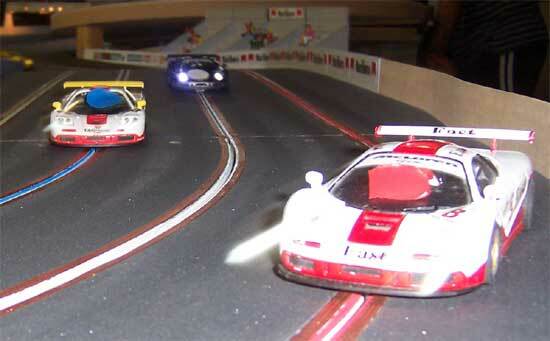 Dave raced his repainted Harrods car which was quietly sped around for an eventual 2nd place. 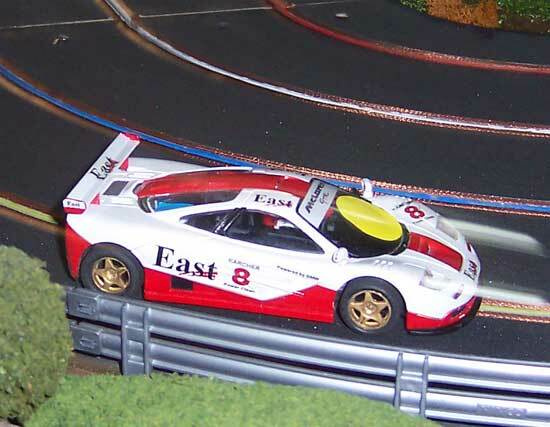 The Fina is another of Daves repaints driven by Viv. unfortunately the car had 50 cent pieces for wheels or so it sounded. This kept Viv away from the pointy end of the field. 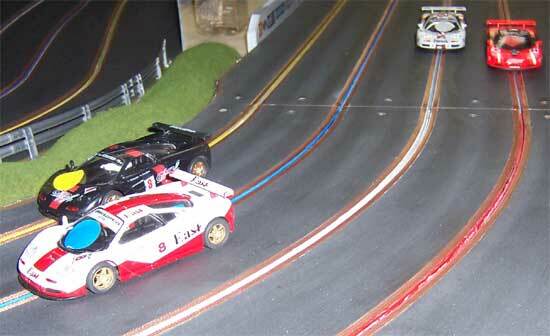 Here he leads Al with Harrods car eventual winner Joe with the West car and Bump with the borrowed Jacardi. Poor old Bump was having plenty of prolems with the car hopping which was thought to be a rear end. This was replaced and found to have done nothing. Charlie told me from his sickbed today that it was actually the front tyre rubbing on the circuit bourd for the headlight as the wheels were not spaced. This lost him plenty of laps too while fixing the car. Glenn you will be happy to hear that Charlie fixed this in about 10 seconds and the car is now blindingly fast again. Here eventual third place getter Basher Bo is sqeezing up the inside of Dave. Charlie is just ahead of Viv in the background. Close shot of Chalie with Bump and new backend and Bo leading into turn two. Dave Joe and Rob into the final turn. Charlie with Bo closing in into the hairpin. The racing is over for the next month or so and now it is back to the drwing board for some setting up for the new classes. Ninco JGTC cars are one of our new classes for next year. Standard ones that is. Thanks to Charlie for letting me borrow a car and having a little fun, otherwise I would have been confined to Race Control for the evening. My own car was sidelined after it spat out 2 crown gear teeth during final testing - the pinion had a slight burr that must have been grinding gear teeth away. Marshalling in the dark was an experience. RobE suggested positioning the lane stickers over a headlight and this really helped. Those marshalls with good memories (i.e. 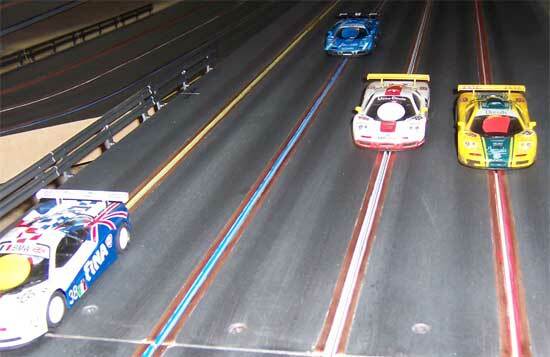 under 45) memorised the lane colours near their positions to correctly return deslotted cars. Woe beheld any driver deslot near an older marshall as you could end up in any lane. And in the event of a multicar stack, bedlum ensued. Some drivers were unfortunately caught up in a couple of these and lost laps. Digital would have been a definite plus ! The racing was much closer at the top than the lap counts show as some drivers just lucked out in a couple of multicar incidents. I was the only driver under 45 and I couldn't remember where to put the cars. From my avatar you would think I was about 65. "Oh my aching back" "Get away from me Ninny"